Tales of centuries of murder and mayhem draw visitors to the sleepy town of Uglich. Uglich may be the only town in the world to sport a knife-wielding boy on its coat of arms – and he is there for a reason. Local princes died here with startling regularity, only a few years after taking the throne and often leaving no heirs. Others disappeared from the manuscript records, went insane, were chained in dungeons, had their eyes poked out, had their in-laws strong-armed into Holy Orders... Or, they were simply drowned in the river. It often seems as though the fate of Crown Prince Dmitry – the only surviving heir of Czar Ivan IV (the Terrible) – was sealed from the moment of his arrival in Uglich. It is the Crown Prince himself who appears on the town’s crest, with his ill-fated knife in hand. Crown Prince Dmitry died at the age of eight, but the political maelstrom his mysterious death gave rise to (the Time of Troubles) would last another 22 years. He was the progeny of his father’s sixth marriage; even though the Orthodox Church did not recognize his claim to the throne for this reason, he nevertheless remained the sole heir to the House of Rurik. Witnesses assert that Prince Dmitry died during a knife-throwing game called “tychka.” The rules remain the same to this day – a line is drawn on the ground, and whoever embeds the knife in the ground the furthest away is the winner. Legend claims that the prince was seized by an epileptic fit during the game and accidentally stabbed himself through the neck. By 1606, almost 15 years after his death, Prince Dmitry was canonized. A chapel was built on the site of his grave, which became the location of a children’s cemetery. Every year on May 28, Prince Dmitry’s Memorial Day is marked in Uglich. The Crown Prince is considered a patron saint of children. His memorial day is celebrated in the Church of Prince Dmitry-on-Blood with a solemn mass, as well as a procession of the Holy Cross that carries the shroud in which the prince’s body was wrapped when it was brought from Uglich to Moscow. The bell that tolled the news of the Crown Prince’s death and prompted civil unrest was “executed” – its clapper was torn out – and then exiled to the Siberian city of Tobolsk. In the Siberian fortress, the bell was engraved with the words: “the first insentient Siberian convict.” After 300 years, it was returned to Uglich, where it is now an exhibit in the Uglich State Historical Archive and Art Museum. The fates of the princes who came before Dmitry were no less tragic. The sons of Uglich’s first duke, Vladimir, died without leaving any heirs. The principality was then seized by Alexander, the son of Prince Fyodor the Black of Yaroslavl. After Alexander promptly disappeared, there was a Rostovian prince (also named Alexander) who took the throne and similarly vanished from the pages of history. Shortly after, his sole son and heir, the 20-year-old Prince Yuri died, childless. The principality of Uglich was then seized by the Muscovite Grand Prince Ivan “Moneybags” Kalita. Konstantin, son of Prince Dmitry of the Don, died just five years after acquiring the town, and he too failed to leave an heir. The next Prince of Uglich was Andrei the Great. He had been born in the town when his father, Vassily II, was living there in exile after his eyes had been put out by supporters of Dmitry Shemyaka. Andrei the Great fell from favor with his brother, Grand Prince Ivan III, and ended his days chained in a dungeon, where he died under unexplained circumstances. His sons were held in captivity for many years before being strong-armed into taking monastic vows. Ivan the Terrible’s brother, Yuri, reigned as duke in Uglich, where he went insane. His only son barely survived him by a year, while his wife took the veil at the Goritsky Monastery of Resurrection. She was, however, swiftly drowned in the Sheksna River on order of the Czar. The town of Uglich was ransacked and looted during the Time of Troubles. However, the town’s appearance barely changed from the late 17th to the early 19th century, lending it a picturesque quality. Even during the Soviet era, the town did not change much. A reservoir and hydro-electric station were built by prisoners during the period from 1935-1955, but they did not greatly change the landscape. Today, the reservoir reflects a broad view of the Uglich Kremlin, monasteries, traditional cottages, the manor houses of noblemen and merchants, and the town firetower on the main street – it is a picture of Russia as painted by landscape artists of old. Tourists who come to this town on the Volga River constitute an important source of income: they account for the large number of hotels, cafes, official and private museums in Uglich. Many of the museums thrive upon the grim aspects of the town’s history. Romantics may appreciate the Museum of Myths, which includes various superstitions of the Russian people, waxworks, and even a “model of a ghoul’s skeleton.” More skeptical visitors might prefer the privately run Prison Art Museum. Sadly, though, this collection is not housed in Uglich’s Prison Tower, which is occupied by the residence hall of the Teacher Training College. Apart from the obligatory visit to the Uglich Kremlin, it is also worth taking a look at the Assumption Church and the Holy Resurrection Monastery. The monastery buildings were built from 1674-1677, thanks to the efforts of famous Rostovian Archbishop Jonah – a great patron of architecture who took his own monastic vows in this ancient monastery. Nearby, there is the Church of St. John the Baptist on the banks of the Volga. 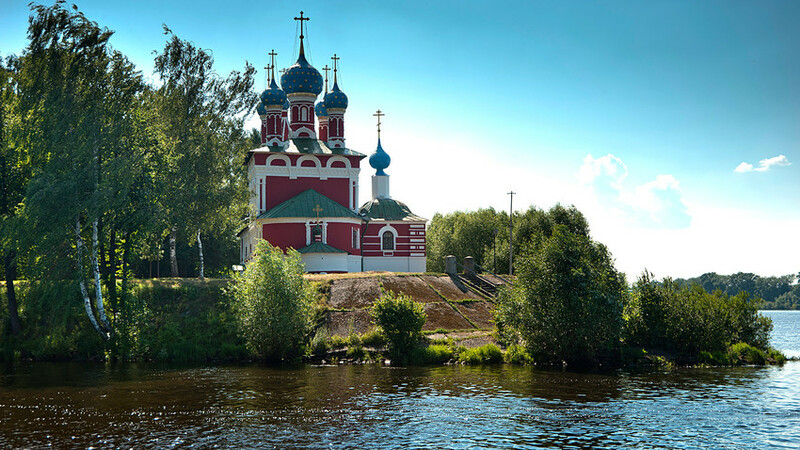 This charming church was built in 1690 by wealthy Uglich local Nikofor Chepolosov. Nikofor built the church in memory of his son, Ivan, who was abducted and slain by an insane petty official – yet another sad example of the Uglich phenomenon.